Berta needs a new loan to provide the capital for available work, which will allow her to buy supplies for making invitations, greetings cards, flower arrangements, etc. so she can fulfil existing orders and give her customers the best possible service. She is trying to maintain her income source which allows her and her family to get by. 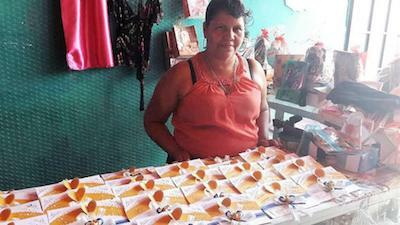 Since she has been using loans to improve her business she has managed to stock up her inventory, which has allowed her business to grow slowly and she is generating income to fulfil her obligations. She supports her own family and they manage to get by on their current economic circumstances. Congratulations to Berta in El Salvador!